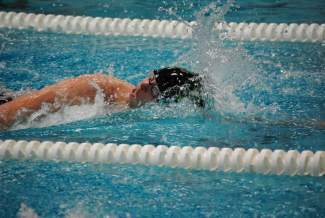 Incline’s Jimmy Baldwin did not disappoint at the Northern Region Swimming Finals in Carson City this past Saturday. Baldwin qualified to compete in the Division I-A State Swimming Championships in two events — the 100- and 200-yard freestyles. He finished third in the 200 free, posting a time of 1:56.84, and was fourth in the 100 free, in a time of 53.46. The top four finishers in each event advanced to the state championship. But first, swimmers had to advance past a trials round on Friday, which required a top-eight finish. Incline, a Division III school, competes among the larger Division I-A in swimming, making it that much tougher on the Highlanders. Nevertheless, aside from Baldwin’s state-qualifying performances, the Incline girls advanced several relay teams past the trials round. The girls 200-yard medley relay team, made up of Caroline Parkhill, Marcella Collins, Jordan Jones, Anna Hartman, Chloe Whatmore and Rachel Colarchik, came closest to earning a state berth. The group finished fifth, one spot away from qualifying, in a time of 2:26.03. The Incline girls 400 freestyle relay, with Colarchik, Collins, Tonking, Jones and Joanna Koukouvetakis, finished sixth in 4:58.49, and the girls 200 freestyle relay of Colarchik, Parkhill, Hartman, Kerrie Tonking, Mariah Hartley and Jones was seventh in 2:27.65. The state championship meet is scheduled for Saturday, May 18, at the Carson Aquatic Center.